The USC men (5-2, 5-1), coming off a win at Stanford in their most recent meet, are ranked No. 22 in the latest CSCAA poll while Utah (9-0. 2-0) is No. 25. Friday’s action is set for 6 p.m. (MT) with an abbreviated program of exhibition swims as well as the 1650y free, which will be scored. The balance of the meet is set for Saturday, with racing starting at 11 a.m. (MT). * Sophomore Dylan Carter: 50y free (19.61), 100y free (43.14), 200y free (1:34.05), 100y fly (46.16), 100y back (46.90). * Freshman Jonah Hu: 100y breast (55.16). 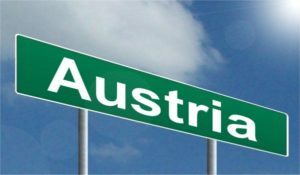 * Junior Morten Klarskov: 200y IM (1:47.79). 100y breast (54.63), 200y breast (1:57.85). * Sophomore David Morgan: 100y breast (55.28). * Senior Cristian Quintero: 100y free (43.99), 200y free (1:36.99). * Sophomore Steven Stumph: 200y breast (1:58.83). * Senior Cary Wright: 400y IM (3:53.03), 200y fly (1:46.05), 100y back (48.30). 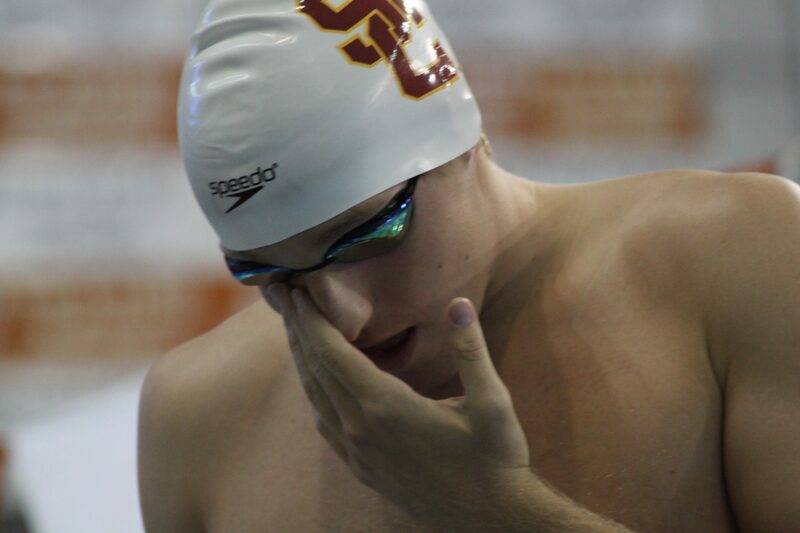 USC also has ‘B’ cuts in the 400y relay (2:53.70) and the 200y (1:26.12) and 400y medley relays (3:10.21). Additionally, divers Deon Reid, Dashiell Enos, Collin Pollard and Adam Payne have posted NCAA cuts on 1- and 3-meter and Reid has one on platform. * 50y free: Dylan Carter (19.61) 23rd. * 100y free: Santo Condorelli (42.95), 5th; Dylan Carter (43.14) 14th; Ralf Tribuntsov (43.37), 25th. * 200y free: Dylan Carter (1:34.05) 6th. * 1000y free: Pawel Furtek (9:12.25) 25th. * 1650y free: Pawel Furtek (15:03.91) 17th. * 100y fly: Dylan Carter (46.16) 8th; Ralf Tribuntsov (47.01), 23rd. * 100y back: Ralf Tribuntsov (46.40), 10th; Dylan Carter (46.90) 14th; Luca Spinazzola (46.99), 15th tie. USA Swimming named USC head swimming and diving coach Dave Salo as the national women’s head coach for the 2015 FINA World Championships on Nov. 17. Salo, now in his ninth year as the Trojans men’s and women’s coach, will join U.S. men’s coach Dave Durden, who also directs the men’s team at Cal. The 2015 FINA World Championships are set for Aug. 2-9 next year in Kazan, Russia. Salo will be serving as the U.S. women’s head coach at the Worlds for the second time, having also directed the team in 2013 at the games in Barcelona. Cristian Quintero represented Venezuela at the 2014 Short Course Worlds and posted four top 20 finishes, including a final appearance in the 200m free (eighth). 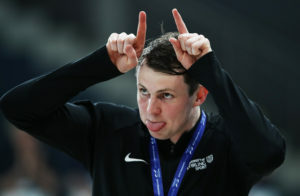 He was also 18th in the 50m free, 12th in the 400m free, 19th in the 100m free. The Trojans return seven All-Americans, including senior freestyler Cristian Quintero, senior backstroker Luca Spinazzola, senior breaststroker Sergio Lujan Rivera, junior butterflyer and sprinter Maclin Davis as well as a talented group of sophomore freestylers Dylan Carter, Reed Malone and Santo Condorelli. Other returning Trojans with NCAA Championships experience include senior breaststroker Andrew Malone, senior freestyler Chad Bobrosky, junior distance freestyler Ted Singley, junior breaststroker Morten Klarskov and senior distance freestyler, butterflyer and IM’er Cary Wright. Senior diver Jordan Gear and junior diver Collin Pollard both return with NCAA Zone experience and look to qualify for their first NCAA Championships. Quintero joins Andrew and Reed Malone (no relation) as 2014-15 co-captains. Quintero, who was granted a fourth year of eligibility by the NCAA after he initially was granted three years when he enrolled, did not compete in the fall but resumes this spring semester. USC is the defending NCAA champion in the 800y free relay and won that and the 400y free relay at last year’s Pac-12 Championships. 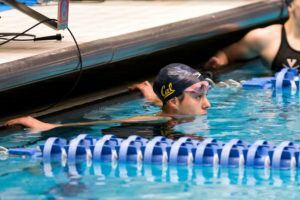 Three quarters of the 800y free title team are back (Quintero, Reed Malone and Carter) while Quintero and Carter also swam on the 400y free relay. 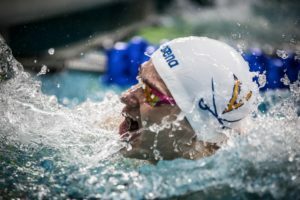 Among the top newcomers figuring to make a big impact this year are freshmen Pawel Furtek, Jonathan Knox, Ralf Tribuntsov, James Clausen, James O’Brien, Ian Silverman, Jonah Hu, diver Dashiell Enos and junior diving transfer Deon Reid. 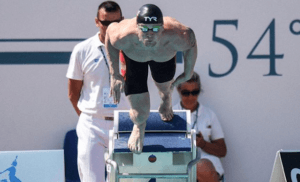 Tribuntsov is an Estonian national record holder whose versatility can help in many events, Knox is a talented freestyler and Furtek is a Polish distance freestyler. Silverman comes to USC an accomplished Paralympian who looks to be a regular contributing member of the team despite the mild form of cerebral palsy affecting his lower extremities. Enos is a rising junior national diver while Reid is a transfer from Duke.